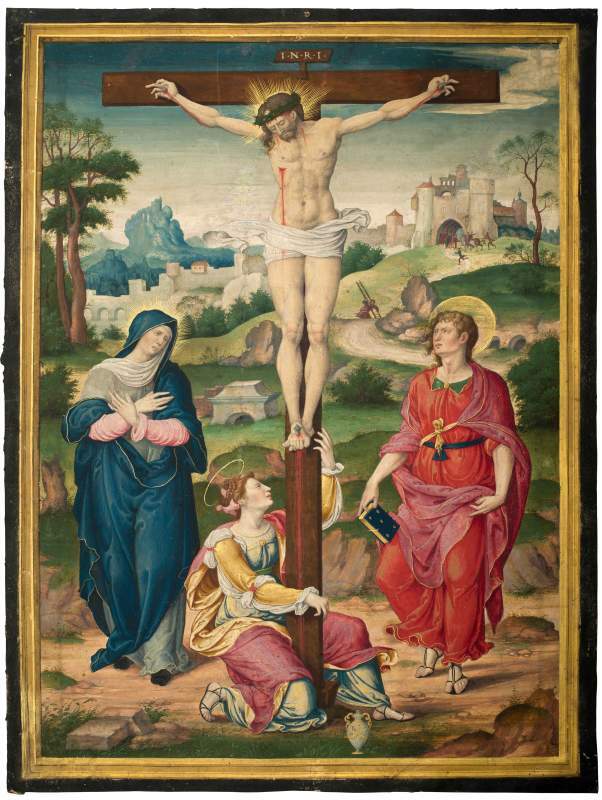 Crucifixion (France, Paris, c. 1520-1530), a beautiful miniature attributed to the workshop of Noël Bellemare, is now in the collection of the Musée du Louvre, Départment des Arts graphiques (RF 55350). It has recently been on display as part of the exhibition François I and Dutch Art. The style of this comparatively large illumination (405 x 300 mm) can be localized and dated within the early-to-mid 16th century in France, likely from the reign of King François I (1494-1547). Betraying a balanced reaction to the Renaissance ideals of drapery, pose, and expression, this elegant Crucifixion was most likely produced as a separate work of art, independent of any bound, illuminated book and without companion leaves. On the stone at the bottom left of the painting, two letters of an inscription can be vaguely discerned: possibly NB, which may stand for Noël Bellemare. Bellemare was an artist first active in Antwerp (c. 1512) but later documented in Paris, where he worked until 1546. The Crucifixion can be assigned to the so-called "Bellemare Group" and bears close comparison with late works by this workshop, such as the Hours of Anne de Montmorency, on which Bellemare worked at the end of his career with younger Renaissance artists, such as Niccolo dell'Abbate or Jean Cousin.